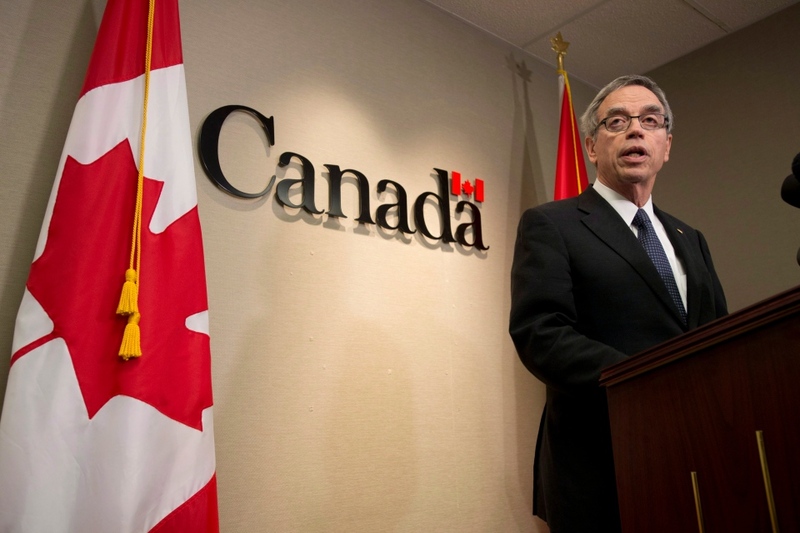 Natural Resources Minister Joe Oliver will be Canada’s next finance minister, CTV News has confirmed, as Jim Flaherty steps down from the position he's held since 2006. Oliver is expected to be named finance minister in Ottawa on Wednesday, a day after Flaherty announced he is leaving the post to enter the private sector. After being elected to the House of Commons in 2011, Oliver was quickly promoted into cabinet, taking over the natural resources ministry. 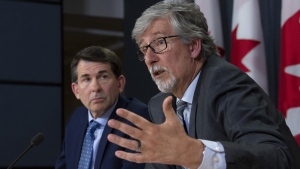 Prior to entering politics, Oliver, 73, was executive director of the Ontario Securities Commission and was also named the CEO of the Investment Dealers Association of Canada. The Toronto MP began his career in investment banking at financial management firm Merrill Lynch. Flaherty said in a statement released Tuesday that he told Prime Minister Stephen Harper of his intention to resign on Monday. “This was a decision I made with my family earlier this year, as I will be returning to the private sector,” Flaherty said in his statement. Flaherty’s statement only said that he is “resigning from cabinet,” but did not specify whether he will remain an MP until the next election, scheduled for the fall of 2015. The statement also did not specify where Flaherty’s new job will be. Flaherty has served as finance minister since he was elected to the federal riding of Whitby-Oshawa in 2006. He previously served as a minister in Ontario’s provincial government. "In a political career of almost 20 years, Minister Flaherty has exemplified the best qualities of those who enter public life: a true commitment to service, and a sincere desire to leave the country in better shape than it was when he entered politics,” Harper said. Flaherty had previously said he would run again in 2015, but had also said he only wanted to usher the federal books back to balance before deciding on his future. In his latest and, as it turns out, last budget, unveiled last month, Flaherty projected not only balance but a surplus in 2015. Flaherty denied that his health factored into his decision. He has been coping with a painful skin condition that required him to take powerful medications that left him appearing bloated, and looking and sounding at times extremely fatigued. NDP Leader Tom Mulcair paid tribute to Flaherty in a brief statement issued Tuesday evening. “In the past year, Mr. Flaherty continued to serve in one of Canada’s most difficult jobs despite facing health challenges. He did so with the same strength of character and sense of humour that has characterized his tenure as the finance minister of Canada. I am happy that in his statement today, Mr. Flaherty has announced that he is on the road to a full recovery,” Mulcair said. Harris praised Flaherty and Harper for “steering Canada through some very challenging times,” and said Flaherty “has been pretty compassionate, as well,” through his initiatives for families and for people with disabilities. “He’s a caring, decent, good guy, and he should be remembered that way,” Harris told CTV News Channel. 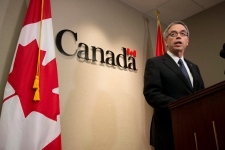 Carney said one of the high points in Flaherty’s career as finance minister was hosting the G7 meeting in Iqaluit during the global recession. “Canada stood literally and figuratively at the top of the world given its economic and financial performance. That year Canada re-established the G7 and helped put in place the conditions for recovery. Much of that was down to Jim Flaherty, my colleague and friend," said Carney, who is currently governor of the Bank of England. Flaherty was born in Lachine, Que. on Dec. 30, 1949 and, after growing up in Quebec, went on to earn a BA from Princeton University and a law degree from York University’s Osgoode Hall Law School. He helped found law firm Flaherty Dow Elliott before jumping into provincial politics in the early 1990s. He lost his first time out, but won the Whitby-Ajax riding in 1995 and held several cabinet posts over the next decade, including labour, finance and deputy premier. After two unsuccessful attempts to win the leadership of the Ontario Conservatives, he made a successful leap to the federal scene in 2006, winning in Whitby-Oshawa. As federal finance minister, Flaherty made tax cuts a priority, starting with a one-per-cent cut to the GST, followed by another cut in 2008. In 2007, Flaherty introduced the Registered Disability Savings Plan to help Canadians with disabilities save for retirement, and in 2008 introduced the Tax-Free Savings Account. He also raised the base deduction rate, cut a point from the lowest personal tax rate and raised the limits of the two lowest tax categories. Flaherty wasn’t afraid to spend, however, once the 2009 recession hit, pouring billions of stimulus into the economy via the Economic Action Plan. Flaherty thanked his constituents, his House colleagues, his wife, Christine Elliott, who represents her husband’s former provincial riding, and the couple’s three sons: John, Galen and Quinn. “We live in the greatest country in the world, and I want Canadians to know that it has been my honour and my privilege to serve them,” Flaherty said. 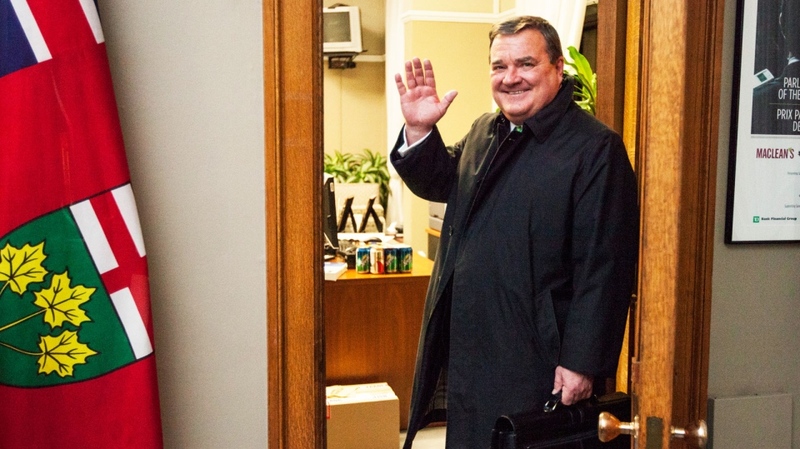 Finance Minister Jim Flaherty waves goodbye in this photo that was included in his statement of resignation from cabinet on Tuesday, March 18, 2014.